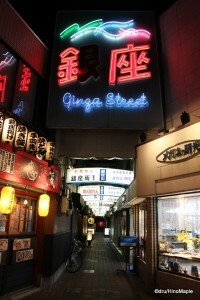 Kuwana can easily be described as a suburb of Nagoya with very little in the way of attractions. While I may think this way, I really didn’t give Kuwana enough effort as I was there for just a single night and morning. There are things to do around Kuwana but they are at least a bus ride away so I didn’t have the slightest chance to head over there to check them out. While that is said, the major attractions around Kuwana aren’t your typical tourist destinations, at least not by my book. The attractions tend to be more modern and for a typical tourist to Japan, they often want to see “traditional Japanese” or “ultra-modern Japanese” things. With Kuwana being pretty spread out, you will either wait for buses, paying a lot for taxis, or skipping a lot of what Kuwana has to offer. 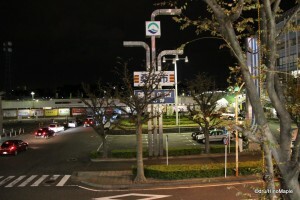 Unlike other areas where the attractions are close to the station, Kuwana offers nothing special close to the station and even the station itself is pretty bare. I won’t go into too much detail, but the only attractions I could find that are around Kuwana Station was Rokkaen and the Shichiri Crossing Ruins. Rokkaen is a western house that was built in 1913 and the Shichiri Crossing Ruins is, well, just remnants of an historical event. I didn’t do much research into it but let’s just say that the entrance fee to Rokkaen and the time it would have taken me to get there didn’t inspire me to venture out that far. Across the river from Rokkaen is the Nabana no Sato. It is 10 minutes by bus from Kuwana and it is part of a resort area. They have an onsen as well as what appears to be a huge flower garden. I’m sure flower lovers would love to visit Nabana no Sato, but again, time was a limiting factor and spending just an hour there didn’t seem like enough time from the pictures. It also seems that winter would be a better time to visit as they have a huge light display that looks amazing. Lastly, there is the Nagashima Spa Land along with the Mitsui Outlet Mall that is about 20 minutes from Kuwana Station. Let’s just say that I wasn’t interested in either of those sites and the 4100 yen entrance fee for Nagashima Spa Land was a huge roadblock to me entering the site as well. 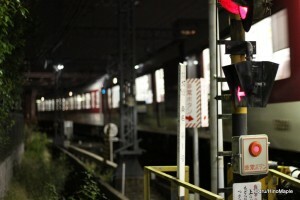 While I didn’t particularly find Kuwana interesting, I did walk around the station at night. I took a lot of time to see what was around and after walking around the block of the station, I found nothing but pachinko parlors and a few places to eat. I ended up going to a place close to my hotel that provided a very interesting atmosphere. It was an Italian izakaya called Teppen. I thought it looked like a good place to eat and since the Saviour and I couldn’t find anywhere else we wanted to eat, we decided to return and try it out. It was a good place but a place that a lot of people will hate at the same time. The shop plays up an atmosphere that is both playful and annoyingly loud at the same time. As we walked outside, the kitchen crew, it was an open kitchen style, would shout hello in Japanese. The workers would do their best to bring customers in and they seemed to have a healthy number of diners at night. 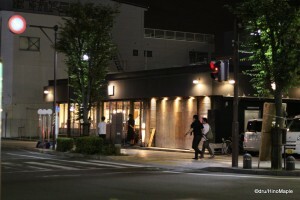 It was a restaurant that was originally started in Tokyo and the owner is originally from Kuwana, so he eventually realized his dream to open the shop in Kuwana. The most annoying part, and yet enjoyable part, of the experience is the show that the entire kitchen crew and wait crew do. It was an all-male crew and they made sure everyone knew everything they were doing. They were very positive about your selection and they made sure they had short conversations with you and played jokes with you. It was kind of like a host club restaurant, but without the pressure to drink. For the first 10 minutes, it was a fun show, but by the end of the night, it was a bit much. I think it was fun and the alcohol did help make it more enjoyable. The food was good too and I wouldn’t mind trying it out in Tokyo but I’ll definitely need to be in the right mood to try it. Kuwana is basically a good way to get to the amusement parks and resorts in the Nagoya area but if you aren’t interested in that, you will find it a tough sell. I don’t think it is a bad city, and I never found a city I didn’t “like” when I travelled around Japan. I don’t think it is for everyone and I wouldn’t want to spend more than a half day in Kuwana. Like Tsu, I wouldn’t imagine visiting Kuwana unless I was going to the F1 race. It is too close to Nagoya and Nagoya has a lot more going for it. I doubt this city will grow much more but they do have enough going for it that people who live in Nagoya will enjoy getting out of the main city for a day trip to see some of the attractions in the area. I doubt it will become a ghost town but as a suburb of Nagoya, I’m sure it will survive well. This entry was posted in Chubu and tagged F1, izakaya, japan, Kuwana, Mie, Mie Prefecture, Mitsui Outlet Mall, Nabana no Sato, Nagashima Spa Land, Nagoya, Rokkaen, Shichiri Crossing, Shichiri Crossing Ruins, Teppen by Dru. Bookmark the permalink. I’m joking, I’m joking, don’t hit me. Isn’t it great that we can walk around at night in a strange place (here in Japan), a bit lost, but we know nothing bad will happen to us? Well, shitamachi does have something that Kuwana didn’t appear to have. An akasen. 😉 Although Shitamachi has a LOT of places to eat if you ask me. Yes, it is great to walk around a strange city at night, but this felt too quiet to be a real city. Even though I didn’t enjoy Okayama, I knew there was a better side to it and I feel I should give it a second shot, although that won’t be anytime soon.